Throughout a typical day, Dr. Michelle Hall does her fair share of running. RJ: First off, congratulations on running, AND FINISHING, the 2016 Boston Marathon. MH: Thank you RJ. It is always an honor and a pleasure to run the Boston Marathon. From the elite runners from around the world and those who compete with physical disabilities, to the men and women over 70 years of age who run the marathon, and the average runners like me, it is truly inspirational to see everyone pushing themselves to do their very best in the race. RJ: How do you feel it went for you? MH: The marathon has been different every time I have run it. There is a lot of science that has to be considered when running a marathon and ignoring the science can result in disaster. Weather is always a big factor. Last year, we faced temperatures of 35-45 degrees and rain for the first 9 miles. Ironically, it was perfect weather for running. This year, we had a glorious warm and sunny day—perfect for a day at the beach. It was challenging, however, for a long distance race! Our starting temperature was 69 degrees with a light breeze. You may wonder, why would 69 degrees be a challenge? It sounds perfect, but during a marathon a runner’s core body temperature can rise to 101 degrees and keeping the body cool is critical for a top performance. Runners typically take on water and fuel to give them the energy and cooling effect needed to finish the race, but by the end of a race, a marathoner is typically somewhat dehydrated and all muscles are running low on glycogen to keep their body moving. For this race, many runners (including me) were sweating while waiting in the corral before the race started at 11:15 am. The sky was blue and there was little shade in the first two hours of the race with the sun overhead. Many of us were using the water stops each mile to pour water on our bodies to keep them cool. This helped a lot, but takes time and slows the running pace. So, there is a trade off of stopping to cool the body, or slowing the pace for each mile as the body heats up. As a result, from the elites to the mere mortals, performance times were considerably slowed. If a runner had been training all winter in 30-40 degree temperatures, the 30 degree temperature change can translate into as much as 20 seconds per mile slowing. I slowed this year, but am happy that I finished with a time that allowed me to re-qualify for the race once again. RJ: Can you tell us about how the course is set up? MH: The race course is always challenging. It starts with a down hill run for four miles, then rolls throughout many small communities. RJ: I hear runners go through every kind of emotion when running these kinds of distances, what can you tell us about that? MH: So true! At the start, there is so much excitement and the feeling that everything is possible. At the half-way mark (13.1 miles) runners can compare how they feel to the last half marathon they might have run. If you are feeling any bit of tired at 13.1, it is a bad sign. Everyone says the half-way mark in a marathon is around 18-20 miles. That is where you can begin running low on your energy stores. A friend of mine says she cries every time she gets to the 18 mile mark. Generally, if you are feeling OK at that point, you will be able to finish strong. The last several miles, especially in Boston, have crowds so large and loud you can’t hear anything but noise. Coming to the finish line is both a blessing and a bit of sadness. As you turn right on Hereford then left on Boylson, you both want the race to be over NOW and want to savor the moment. Once across the finish line, it is pure joy! Students from Wellesley College offer encouragment to the runners. Photo Credit: Jan Morkos, Maine Teen Science Café. RJ: What was it like running with all the crowds of runners and spectators? 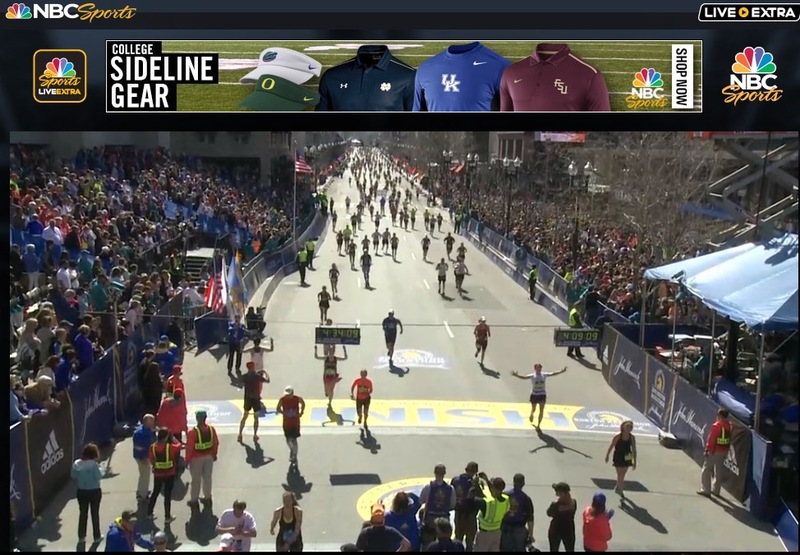 MH: Boston Marathon has over 500,000 spectators and 8,000 volunteers cheering each runner to the finish line. That is about 80% of the population of Boston. Less than 2 miles of the course are actually in Boston. We run through a half dozen small communities along the route. The crowds really make this a special race. They really engage with the runners and help them out. This year, spectators were giving out oranges, bananas, cookies, popsicles, beer, water, wet sponges and paper towels to feed and cool us. As we walk to the start line, there is always a group of young men calling out to the runners offering beer, ribs, and cigarettes. Of course no one takes them, but it gets everyone in a light mood to see them having fun teasing us. “Kiss me I’m a programmer”, “Kiss me I love runners” and many more like these. We can hear them long before we see them, and long after we pass. The other great group is the students at Boston College. They give “free high 5’s” and cheer so loud. It makes a runner forget how much their legs are hurting. #Boston Marathon has the BEST spectators! RJ: Tell me about “Heartbreak Hill,” It should have been easy since you train at 1.5 mile high elevation and there are nothing but hills in Los Alamos, am I wrong? MH: Heartbreak Hill comes at mile 21, very late in the race when a runner’s energy stores in the muscles are getting low. At that point in the race, all blood is going to the brain, heart, and leg muscles. The digestive system has shut down and can’t process food very well. So, Heartbreak Hill is challenging because if the runner has not fueled properly before and early into the race, it’s generally too late at that point. Also, by mile 21, a runners muscles have been accumulating many micro-tears throughout the race and they are not functioning at full capacity. Both of these make it hard to climb a hill. Certainly, training in the high elevation of Los Alamos on the hills helps a lot. Even for the elites, however, Heartbreak Hill is a tough one to climb. RJ: What goes into training to run a marathon? MH: A lot of time, miles, tears, and joys. Marathon training has several segments. The first segment is speed training and included lots of hill repeats, mile repeats at the track, and tempo runs. Throughout the whole training session 75-80% of the miles are run easy. Each week the mileage builds and about every 3rd week it drops down a bit to allow the body to recover a bit. After a month or so of this, we move into the marathon specific phase where there will be tempo runs that stress your aerobic system. I also do cut down runs that teach you how to speed up each mile even as your body begins to tire and you want to stop. These are both workouts that test you physically and mentally. Training is a lot about your mental state. If you don’t believe you can do it, you probably cannot. If you believe you can give it all you have, then you will likely be able to do the workout. Towards the end of the marathon cycle, I run a lot of miles at just a bit faster than marathon pace. The final stage is taper. This is when you begin to decrease your miles, reduce the number of hard workouts, and generally allow your body to heal and strengthen from your months of training. RJ: Did you witness anything along the route that stayed with you? MH: Being a scientist, I was really pleased to see so many of the Wellesley girls with signs that indicated they are choosing science or technology careers. There were some fun and funny signs from them. 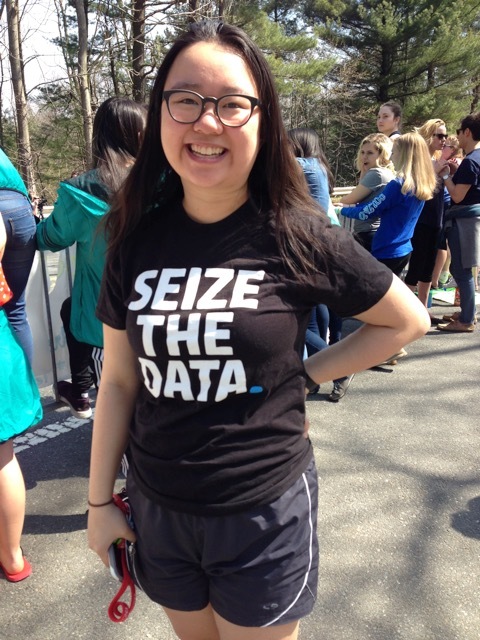 I just loved the Seize the Data t-shirt. About that time in the race, we need humor! 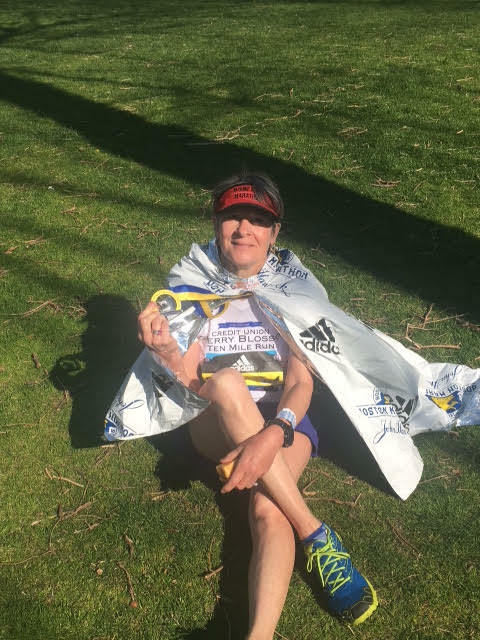 RJ: Any other stories you can share from your 26.2 mile journey? MH: There are many people with disabilities running the marathon. Every time I see someone whose body has limited them in some way, I am in awe. The mental and physical determination they put forth is so great. I am humbled. In the race this year, I was following a man running on two prosthetic legs below the knee. He had some people running with him. Suddenly he diverted to the side of the race. As I watched he went over to another runner who had stopped and was bent over. He approached and touched him on the back. As the man looked up, he put his arm around him and encouraged him back on to the course. They continued on running together. It was a really special moment to see how powerful a simple gesture of kindness can be. RJ: Do you have any future races planned? MH: I am running the Marine Corps Marathon in the fall. It ranks right up there with Boston for a beautiful course and a well run race. I ran it in 2011 and loved it. I cannot wait to do it again. 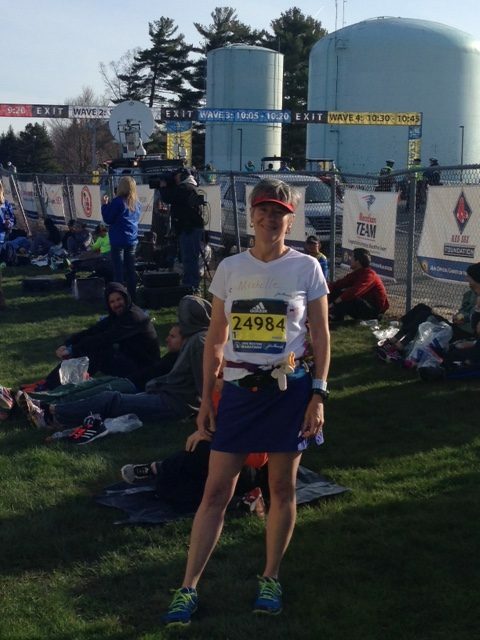 Again, congratulations to Dr. Michelle Hall on running the 2016 Boston Marathon. We are all very proud of you!